The European Court of Human Rights (ECHR) in Strasbourg has upheld a ban by German authorities on activists using images of the Holocaust to protest against the practice of factory farming of animals. The court - the highest legal authority on human rights issues and part of the Council of Europe system to which 47 European countries adhere - ruled that while the ban did interfere with the activists‘ freedom of expression, it "had to be seen in the specific context of the German past". 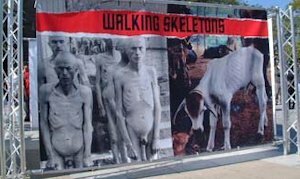 The animal rights activist group PETA (People for the Ethical Treatment of animals) had argued it was being muzzled after it was forced to cancel a 2004 advertising campaign in Germany entitled 'The Holocaust on your plate'. The campaign had already run in the United States. However, in Germany the seven different campaign posters, which juxtaposed photographs of concentration camp inmates and photographs of animals in feedlots, caused shock, particularly among Holocaust survivors. One poster contained photographs of a pile of human bodies and of a pile of slaughtered pigs under the heading 'The Final Indignity'. 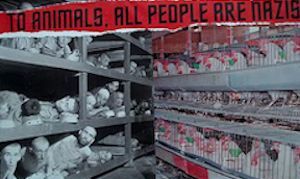 Another showed a photograph of rows of concentration camp inmates lying on bunk beds alongside rows of chicken in laying batteries under the heading 'To animals, all people are Nazis'. The Central Council of Jews of Germany had sought a court injunction preventing PETA from publishing the posters, which was granted by a Berlin court. The judges argued that the campaign trivialized the fate of Holocaust victims and violated the notion of human dignity as set out in Germany's Constitution. The ruling was later confirmed by the German Constitutional Court, but PETA appealed to the ECHR in Strasbourg. “The judges were correct in determining that the [German] ban did not infringe on freedom of expression, but that rather the poster campaign trivialized the Holocaust in an irresponsible manner,” Dieter Graumann, head of the Central Council, said in a statement on Thursday. Lauder strongly urged PETA to voluntarily refrain from using Holocaust analogies in its campaigns.